The Loire Valley is one of France’s most famous regions: a lush green land of gently rolling countryside with rich vineyards, charming towns and magnificent châteaux. No wonder it’s one of our most popular destinations for camping. Loire Valley towns are full of history and character and as you wander through meandering cobbled streets, marvel at the extravagant design of royal residences; you’ll be beguiled by the treasures of past and present. Canvas Holidays has an outstanding range of campsites in the Loire Valley, with accommodation to suit everyone’s budget. Loire Valley camping has plenty to offer couples as well as families – from wine tasting and cycling by the river, to a day out at an astounding futuristic theme park! Futuroscope Futuroscope is a futuristic theme park where the interactive rides use simulators, 3D glasses and sensor bracelets to create amazing experiences and imaginative journeys. Water games and outdoor fun complete this family-friendly day out. As night falls, marvel at the spectacular light and water performance set around the lake. 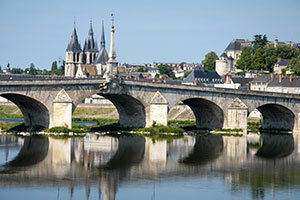 Tours Tours is a lively town with lots of shops, museums and gardens and a busy cultural life. At the Musée du Compagnonnage you can discover the history of trades guilds and travelling craftsmen, and true masterpieces as well as tools and guild memorabilia. Château de Chinon The recently-restored Plantagenet castle where Richard the Lionheart was born and Joan of Arc persuaded the Dauphin to be crowned. In the medieval town below the castle you will find the town museum and the Musée Animé du Vin. Château de Chenonceau With its iconic gallery built right across the River Cher, Château de Chenonceau is renowned for its formal gardens and its many treasures, including superb ‘old masters’ paintings and rare Flemish tapestries. Younger children will love the maze, the play area and the resident donkeys. Le Mans 2015 marks the 92nd year of the gruelling 24-hour race that tests the skills of drivers and the performance of their cars. The track hosts a number of other races over the season and there’s also a large motor museum. Amboise The Italianate Château d’Amboise is the surviving fraction of a favourite royal residence. Nearby is the mansion of Clos Lucé where Leonardo Da Vinci lived for a few years until his death in 1519. Models of his inventions are displayed in the grounds. Château de Chambord The largest and most extravagant of the Loire châteaux, the Château de Chambord is surrounded by an equally vast park, itself enclosed by a 32 km wall. Left empty after the Revolution, the Château’s 440 rooms now house a fine collection of furniture and works of art, and a hunting and nature exhibition. To find your perfect campsite in the Loire Valley please use our interactive site finder, call our knowledgeable customer advice team on 01 242 1901, or go straight to the individual campsite pages.